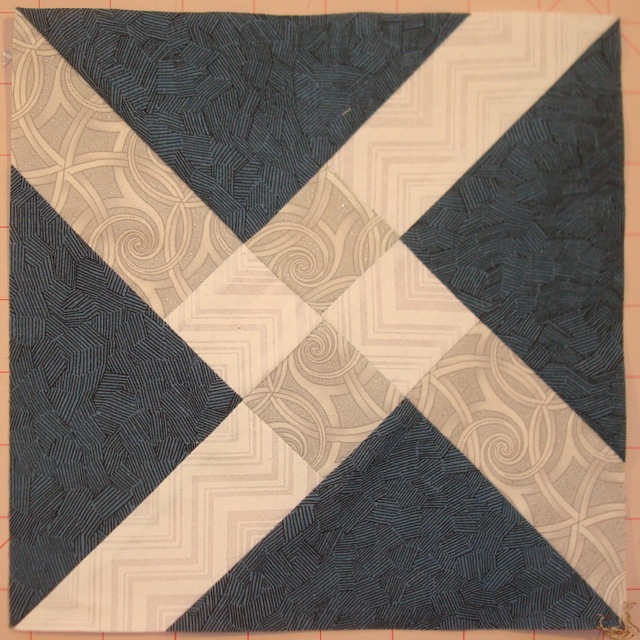 The first of the DnA quilts to be quilted is, of course, the last one to be made: DnA4: In Memory of Edison. I haven’t been feeling very creative (quilting-wise) lately. I have been finishing stuff, just haven’t been able to think of a new project to start. It’s been like that since I came back from Pittsburgh. I was so glad to see the end of the Dragonfly fabric, I didn’t even snap a photo of the finished top! This is the layout in progress. Anyway, I learned lots in making this piece, most important of all is: it’s really worth paying someone else to make the next one! Between the zippers and the piping and the doubled batting (to cushion the little Mac from life’s many bumps), my lack of a working walking foot (long story) the only real surprise to me was that I finished it. As you can see, it’s string-pieced on a foundation. You may notice some fabric from my other projects, including the yellow plaid from Les Filles des Mares. the iridescent dragonflies, from THAT project (above), and, of course, the obligatory Hello Kitty fabric. Doesn’t look like much now, but this is part of the pieced back of DnA3: In Memory of Rumor, which I’ll be quilting next. 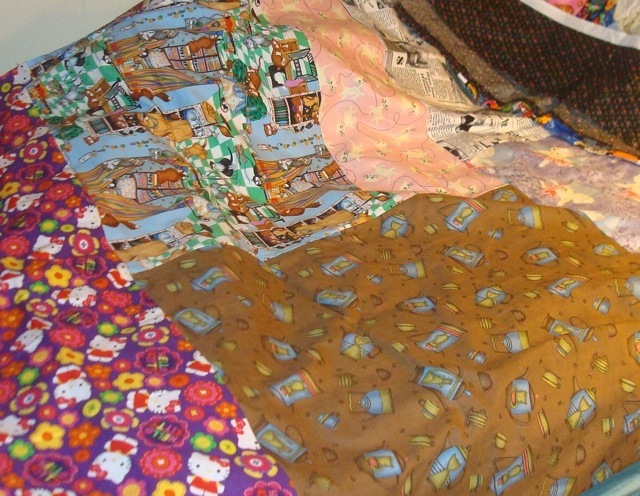 At least two of the strips are backing fabric from some recently completed quilts. In fact, the third strip down is the back of the quilt I have on the long arm at the moment. I, of course, am trying not to go out and buy new fabric in the hopes that inspiration will hit again. 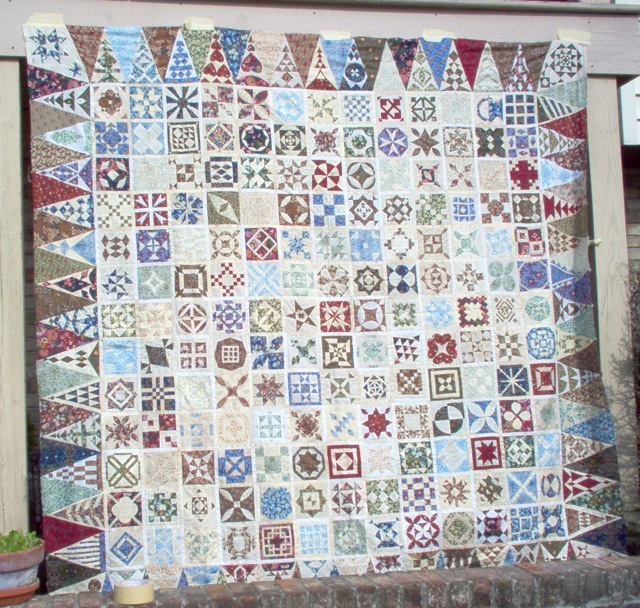 I think until I find a block or vintage quilt that inspires me, I will simply go back to Borderpalooza. I think there are 2 or 3 more than can be finished this year. I have been quilting for more than 25 years, so I can’t really claim to be a “Modern Quilter” and wouldn’t ever describe myself that way. I am a quilter. Period. 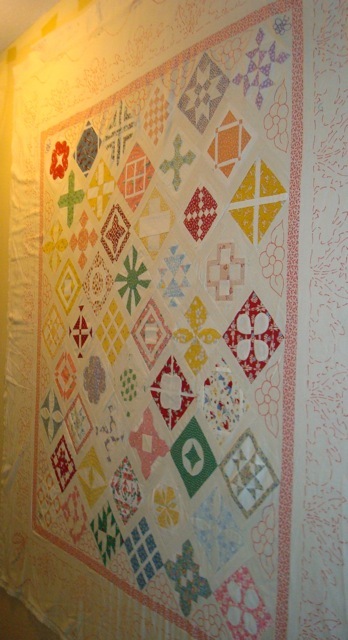 But, for some reason, the term “Modern Quilting” doesn’t annoy me the way it does many of my contemporaries (i.e. 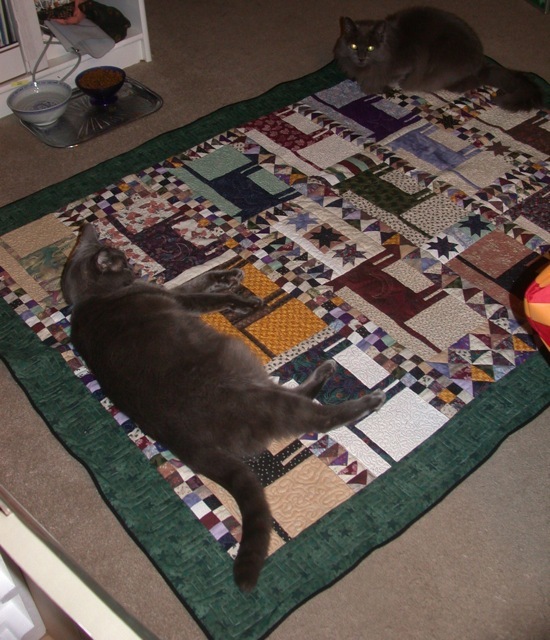 quilters who have been quilting a while). I see it mostly as a marketing thing, but anything that brings more voices in my art, and more fabric to my stash, I see as a good thing. So, for my quilting buds, I am listing reasons why I am grateful that Modern Quilting has come along. 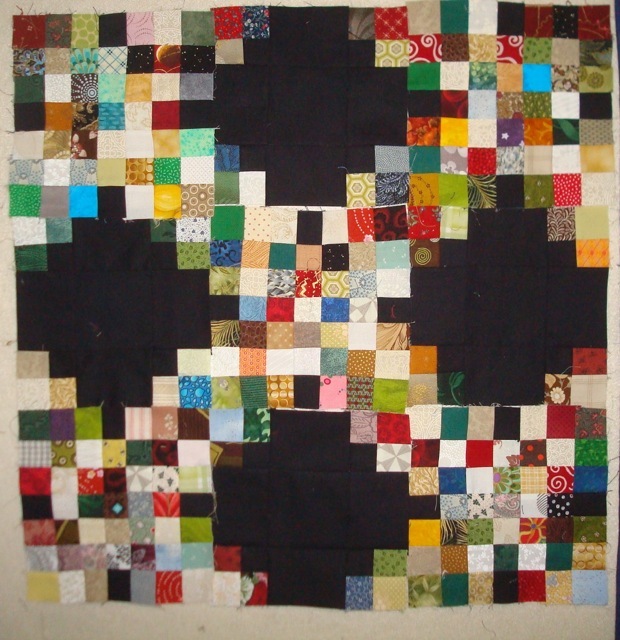 An orphan block from Grandmother’s Choice might be the inspiration for a quilt of its own. 1. Gray. I love grays because they sink back and are a team player. 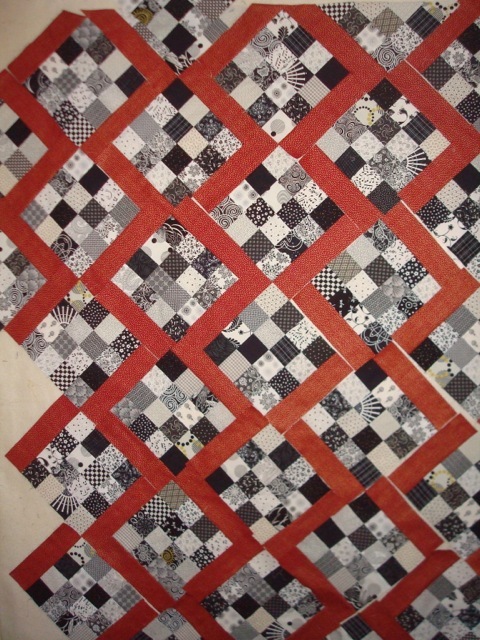 It was getting really hard to find nice grays (and solids, too, for that matter) before “Modern Quilting” took off. Like the Japanese quilters popularizing taupe (another color “discovery” I love), I will always be grateful for the new fabric designers for bringing back nice grays. 2. Online resources. 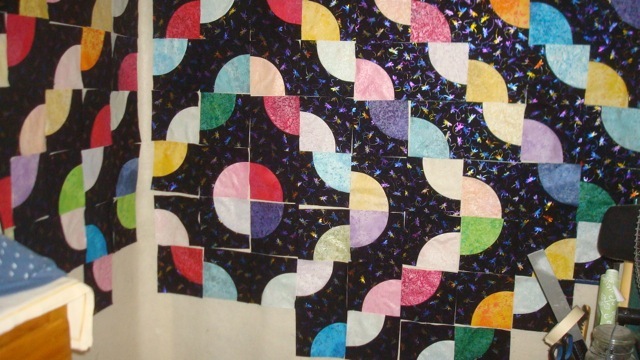 The rotary cutter really revolutionized quilting. I remember it (mostly because I used templates to cut out the pieces for my first quilt… templates, and scissors, and (oh horrors!) a Sharpie!) It’s a wonder I wasn’t burned at the stake back then. Since quilting has become popular again, there are dozens of podcasts, thousands of blogs, and millions of tutorials, both video and written. There are books, and rulers, and templates, and stencils, and patterns directed at all interests and skill levels. There are more ways than ever to connect to like-minded quilters all around the globe, and that’s just wonderful in my book. Crossed Purposes is hot off the long arm! 3. The death of the Quilt Police. Oh, they’re still out there, but they are easier to ignore than ever by attributing your quilting style to something they are less familiar with. 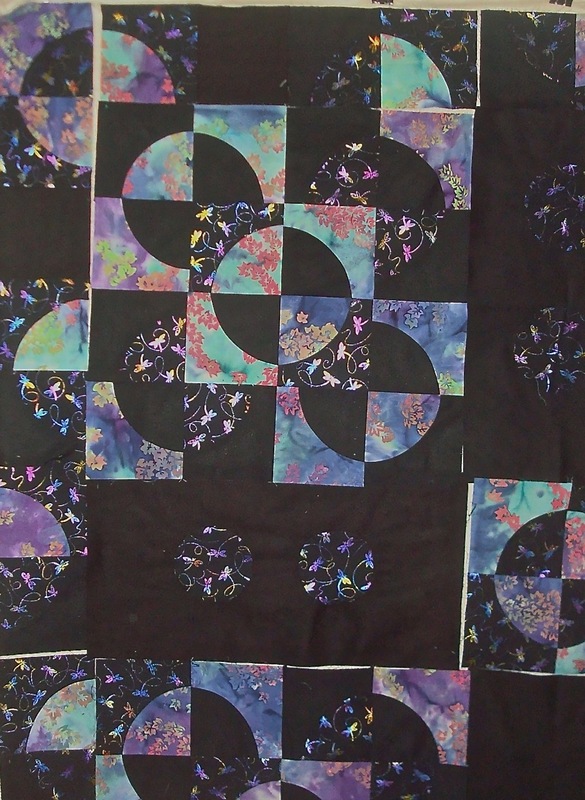 You clipped your points or your corners don’t match: you are exploring “freeform piecing.” You like lots of white space, or you adore the new fabrics? You’re “modern.” You like using billions of scraps? 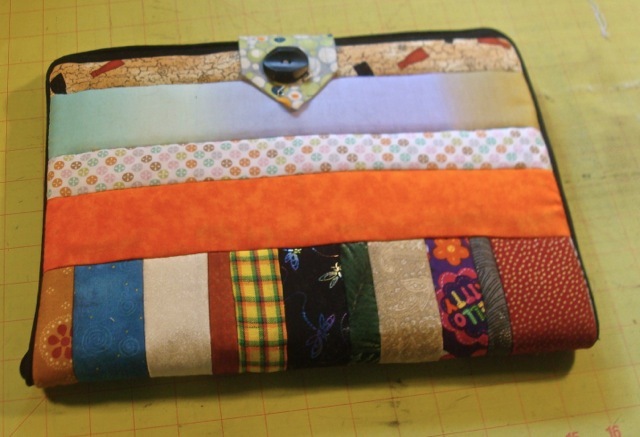 You’re a “scrap quilter.” You’re exploring elements of design using fabrics and other stuff? 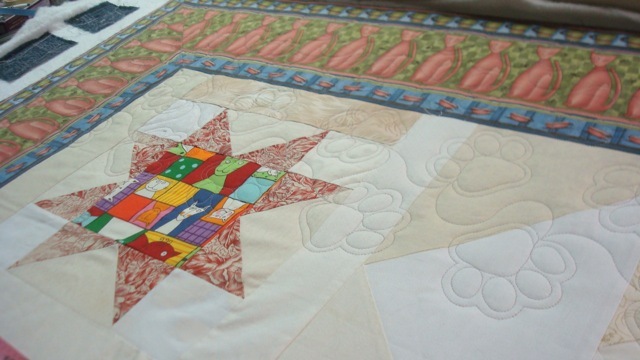 You’re an “art quilter.” There are now more ways than ever to shut those pesky quilt police down. 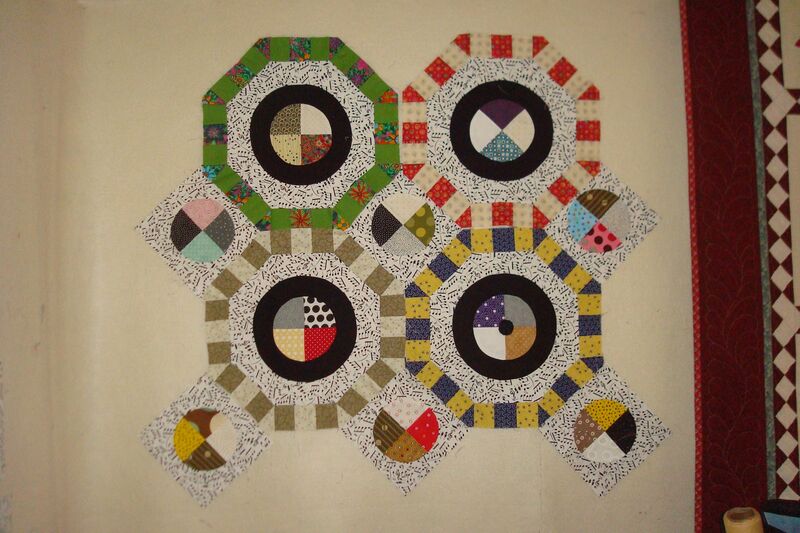 Another possibility for the leftovers from the (many) Drunkard’s Path quilts I’ve been playing with. 4. Experimentation and whimsy. I admire people who can take existing patterns and make them new and fun. In fact, that’s what I try to do when I quilt: start with a parameter and see where I can take it. Solve a “problem.” Probe deeper into a concept. The Drunkard’s Path Blocks are my current “research” and I’m really enjoying myself. Isn’t that the point of an avocation or hobby? If I sewed as much for my business as I do for fun, it would be drudgery. I wouldn’t look forward to my time with my fabric. But because I can’t wait to see what happens when I put all those blocks on my design wall, it’s exciting and fun. 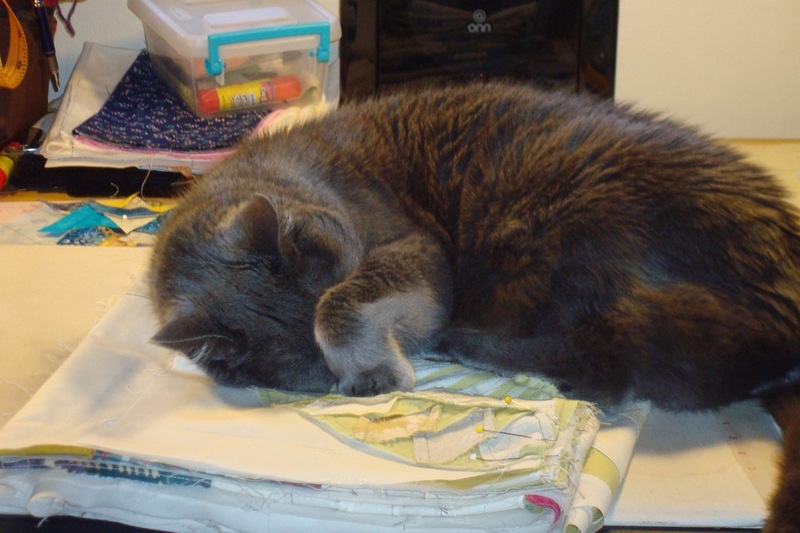 Edison had the right of it: the best part of quilting is enjoying the quilts you’ve made. 5. Making useful stuff is “in” again. Sometimes we get so wrapped up in thinking about what others see when they see our quilts that it seems like we’re constantly preparing for a Quilt Show. One of the things that the Modern Quilt Guild claims makes a “modern quilt” is that it is a utility quilt. I find this really funny because that’s what I’ve been doing for 25+ years, but if they want to make it “cool,” then I’m “down” with that. So if someone describes themselves as a “Modern Quilter.” Don’t regard it as if as if they are looking down their nose at you. Don’t pooh-pooh them as if they are merely following a trend (they may be, but didn’t we all when we started out? And some of us still do because we prefer that specific style.) Think of it as if they are proudly proclaiming themselves “art quilters” or “traditional quilters” or “hand quilters” or “slow quilters” or whatever. Concentrate our commonalities. They are easy to see. It’s in that second word: Quilters. Playing with Drunkard’s Path blocks from my friend, Debbie, I have put about a third of them into this new top which I’m calling Dragonfly Path. 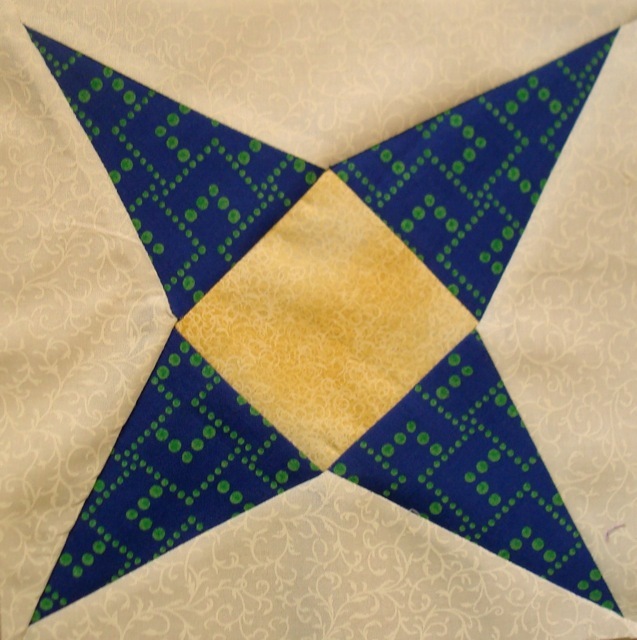 Last week I finished the quilting on Aiming for Accuracy. I am happy that it’s done, but I wish I had picked a different quilting motif. I like the loopy ribbony part, but the lotus blossom seems a bit dense for the rest of the quilting. So, since I’m not enthusiastic about the way it turned out, I have been dragging my heels a bit. The reason you don’t see a photo of it here is that, even though I sewed the binding on, I still have to fold it over and hand stitch it. This is a problem for me in the Summer when I don’t watch much TV. I couldn’t think of what to do next, so I’m taking the week off, but I think the next one on the long arm will be Crossed Purposes. I have a back that I like that’s big enough (although it needs a seam across the middle), but I can’t think of what to do in terms of quilting. 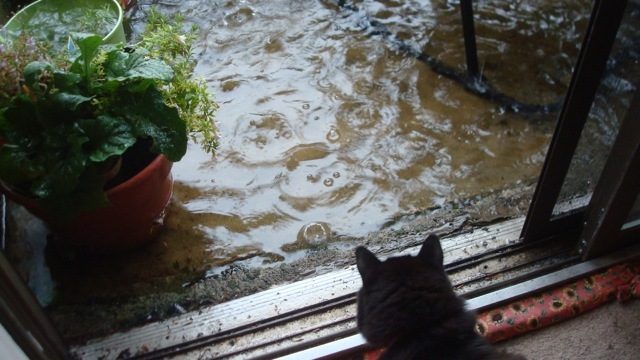 Miko watches intently as our porch gets really close to flooding our apartment. 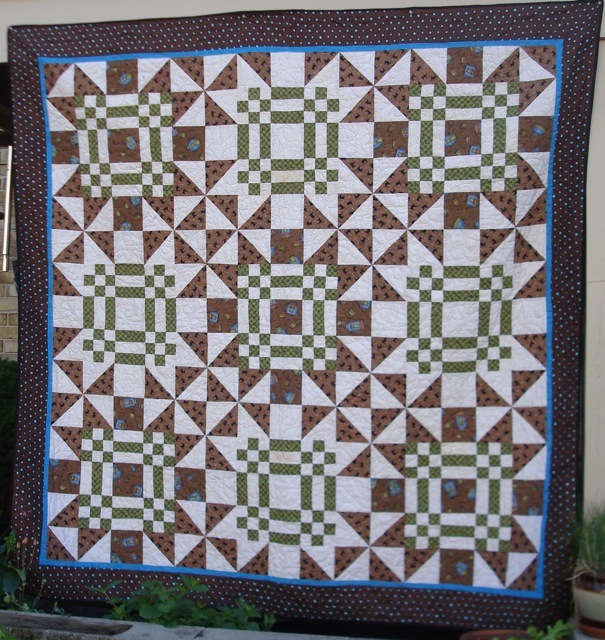 Just edge-to-edge panto will do the trick since there’s so much going on with the piecing, but should I something different on the border (which is what I would do if I were handquilting it)? I have made decisions about the Drunkard Path blocks I got from my friend Debbie who said “sew these all together into a top… and here’s some scraps.” Well, there were about 5 billion of these DP blocks, so I decided that the batik didn’t play well with the others, and I split them off. The result is on my design wall and has been dubbed Dragonfly Path because one of the back background fabrics is printed with iridescent dragonflies. No clue as to what I’ll do with the other 200 or so blocks. Well, anyway, I don’t have to choose anything else today since I’m going to the Farmer’s market in a bit and I still have to hack away at The Echoes. Hope you all have a creative week! I wasn’t going to say anything about Robin Williams because my first thought was “one of us lost.” Most of you who know me, know that I have been diagnosed with Depression (or, what I call “cap D Depression to difference it from the emotion.) I’ve been working on it with (with various rates of success) for years. For me, it’s not about feeling sad. It’s about feeling numb and without energy or motivation. I’ve never felt like committing suicide because that’d be way too much work, but some days, even getting up to make coffee is a major effort. While we don’t really know how or why Robin Williams died, I feel great wonder at what he was able to accomplish given what he had to fight against and a certain amount of kinship with him because of his struggle with Depression. I am hoping that I managed to get all my sickness in early this winter. (I came down with a cold on New Year’s Eve and didn’t actually make it to midnight.) That and the flu made December less than wonderful. 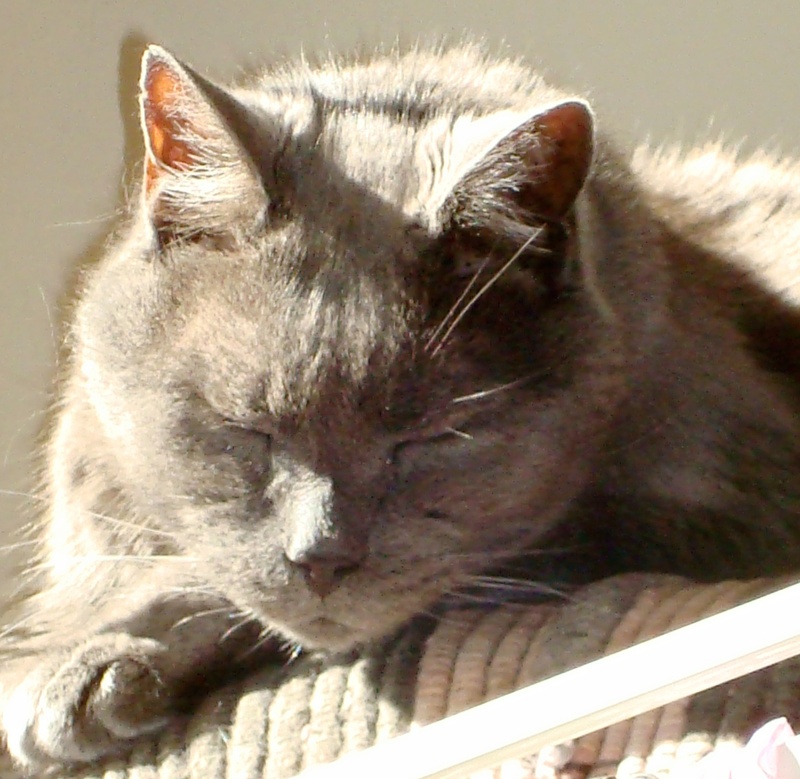 Also, my older cat, Edison, died just after Christmas of heart issues. 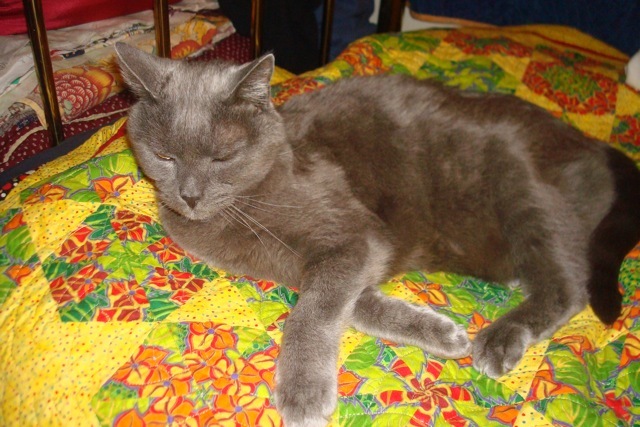 He was almost 16 and had a number of health challenges. 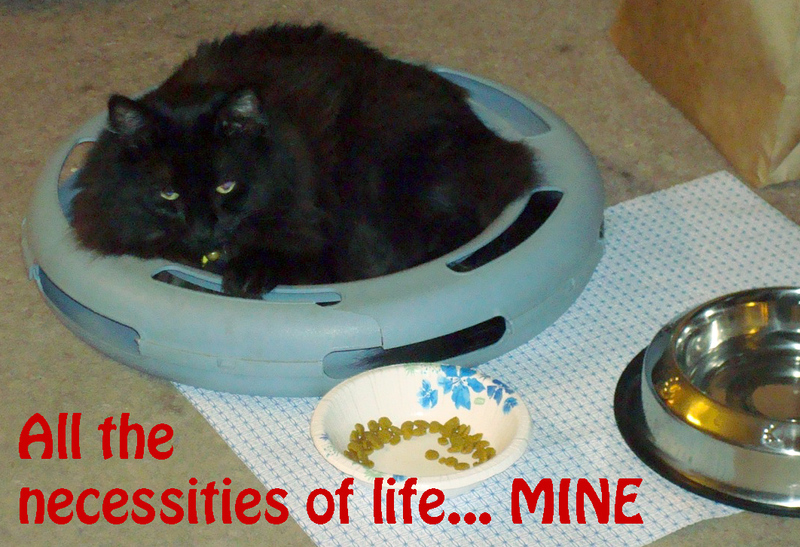 From a wary dockside rescue cat, he eventually turned into quite the loving fellow, if never really much of a socialite. Miko thinks he’s hiding in the closet somewhere. I hadn’t trotted out my Master Plan for 2013 of “finishing more projects than I started,” so I didn’t actually break that promise. It was a very creative year for me until I realized that quilt tops are just not as warm as finished quilts. I finished only 6 projects, and only one was a full-sized quilt (The Quilt That Shall Remain Nameless, as a matter of fact.) However, I started only 7 projects, so I guess that’s not too bad. 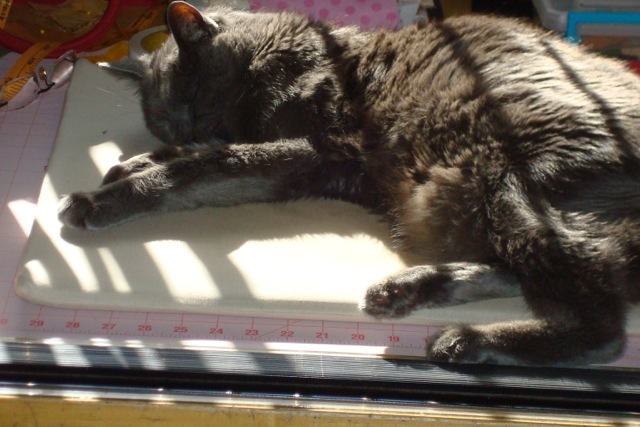 When I am healthier, I am planning on taking over Cricket and Jeff’s long-arm on a semi-regular basis and see if I can at least get a couple of full-sized quilts done. I will be starting with Grandmother’s Choice, and continuing with Sunflower Lattice. I hope to get Sunflower Lattice completed and written up as a pattern to be published, but it’s a big quilt and maybe I should work on a smaller version instead. 1. Rose Quilt (piecing) – Just started. 2. Christmas Dear Jane – Sandwiched and ready for DM FMQ. 3. Grandmother’s Choice – Packed up and ready to be taken to The Beast. 5. Pull out unfinished projects and see if they are at the state the spreadsheet says they are. (I have a number which, apparently, only need borders, and some which the blocks have been put together, but they are not actually a top…I want to look at these and try to develop a plan for them. Sorry this post was kind of “meander-y,” I guess I’m not quite as recovered from the cold as I thought when I started writing. I hope to have photos of some of the bigger projects (like Inari, the red/black/white quilt) that have been put together, but not posted here due to the weather. If you would like a copy of my Excel Spreadsheet to put your projects in, or if you want to share your own Top 5 (or even suggest a pithier name), please feel free to either comment on the blog, or send me an email. I have become consumed with the idea that I might just get this novel done… or at least that I might just write 50,000 words on a single work in a month. Unfortunately, I have been inundated with photos of awesome quilts clearly meant to garner prizes at quilt shows. They are beautiful in intricate and… not really want I want to do. Another relaxing pattern: Triple Irish Chain. What makes this one less than relaxing is that the square finish at 1″. Well, that’s not exactly true. I’d love to make one of those mind-blowing show quilts, but I only have so much wall space… and could I bring myself to sleep under it after it’s won it’s prizes? Could I fold it up and let Ed sleep on it knowing that it would then have to be tossed in the mega-washers at the laundromat? Plus, the simpler the quilt, the more likely I am to finish it. If I hadn’t been making black and white 16-patches this month, if I had had to design and draft the blocks like those in Big Wheels, I don’t think I could have written the novel. 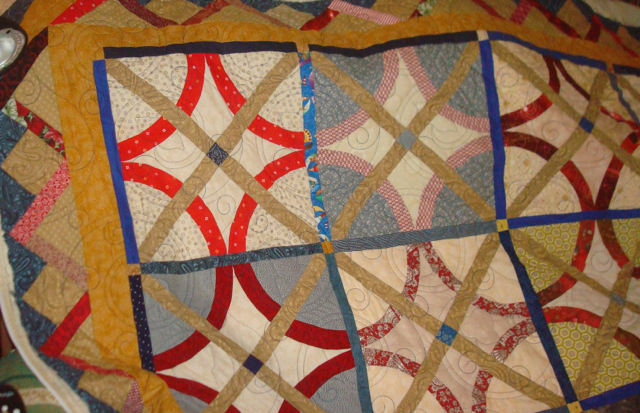 The quilting gave my writer’s brain a rest, and the writing gave my quilter’s brain a rest, and I think it all worked well together. I might just keep it up (to a lesser scale) in the future. I finally got an opportunity to take a picture of the completed Big Wheels top. There’s been lots of construction going on around my apartment building. Today they seem to be filling the Pit of Despair (sinkhole in the parking lot) just beyond my porch. Last week it was the balconies OVER my porch. I was able to sneak outside yesterday morning (between construction crews) and snap a photo of the finished Big Wheels top. It’s a wonder I get any quilting done at all… Maybe I should go back to handquilting. 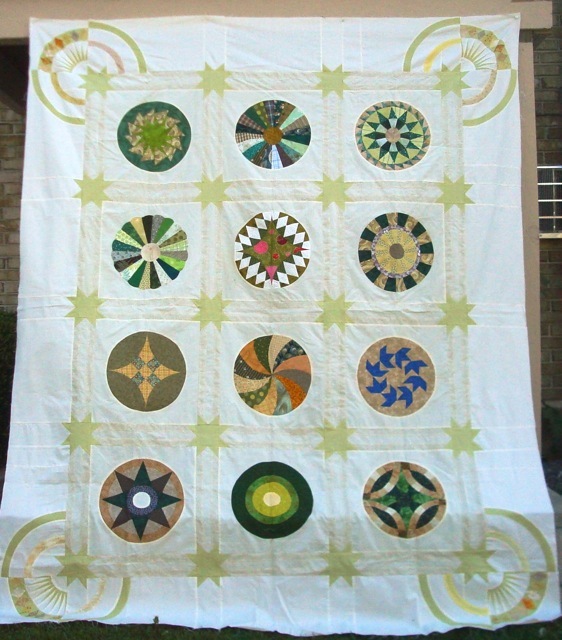 The quilting will emphasize the faint green stars, and the circle patterns will almost certainly be stitched “in the ditch.” I will continue the circles in the border with quilted circles and arcs and filling patterns. But, for now, I’m setting it aside. 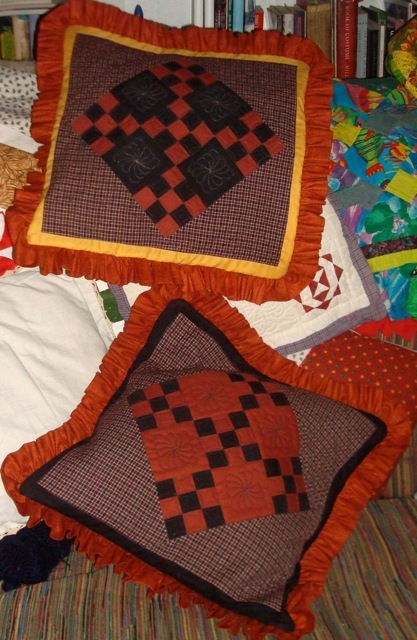 All my quilts must rest, it seems, before they are quilted. The sunflowers quilt has grown and now has a name: Sunflower Lattice. I’ve been working on more Sunflower blocks since last week. Once you get used to the seams being on the bias, the block is actually quite easy. I had planned to write the instructions, but it seems that I should include information on cutting out the pieces since not everyone knows how to work with the angles on the ruler. That part of the task is daunting. I’d rather write about the sewing. 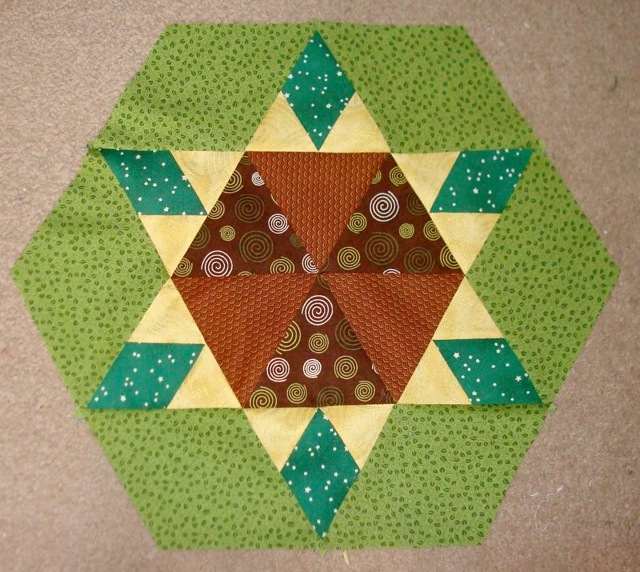 Sunflower Lattice is actually easier than you think it is, because there are no inset seams. The only tricky part is making sure the points meet. In square/rectangular blocks, if you line up the seams, you can tell where the seam will cross the other seam. I almost always pin and mark the intersections when working with 60 degree angles. In quilts using other angles, I end up pinning and marking the intersections. If you were to match the seams on the edges, the points would be off because the seam is at an angle. 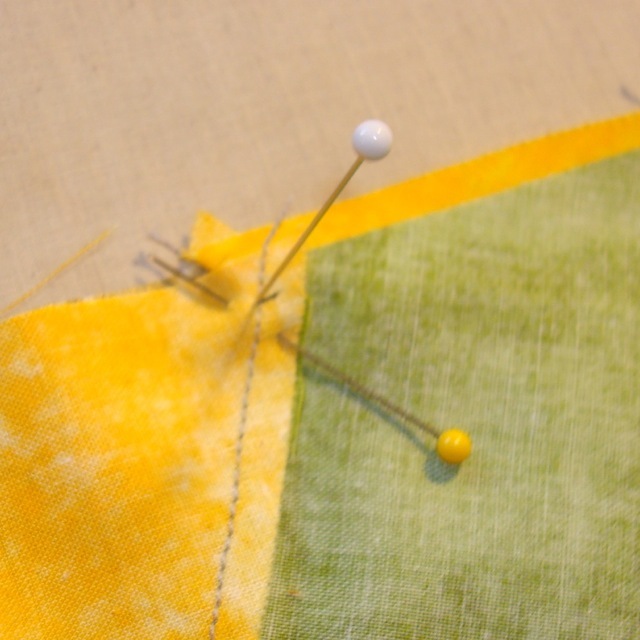 First I match the intersections by putting a pin vertically through both, lining up the fabric the way I want it to be sewn. Then, I make a tiny mark on the seam allowance where this intersection is. That way I can “aim” my sewing machine at that dot and I will be sewing in the right place. It takes a bit of practice, sewing dot to dot, but it’s much, much easier than continually ripping out your seam when you don’t get it right. 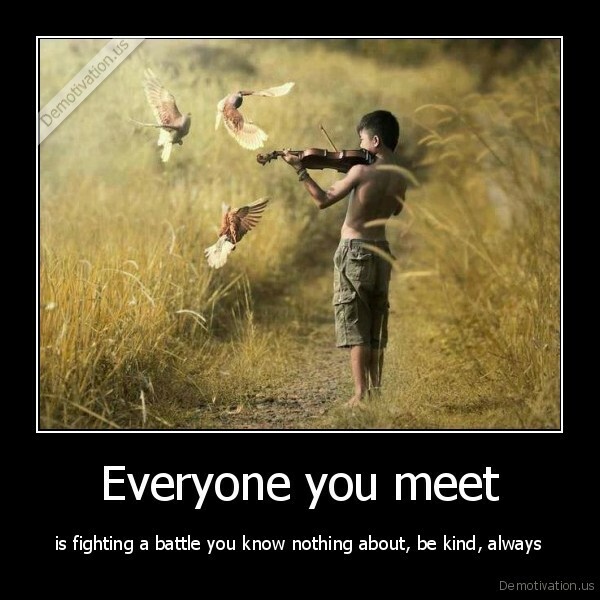 I seem to be starting all my blog entries with apologies lately. I haven’t felt much like writing. Everything I type seems to come out disjointed and uninteresting. But, it’s been two weeks, so I guess I’ll show you want I’ve been up to. Grandmother’s Choice Block 34 (I think.) The handle is a bit small for the size of the cup. If it was a “normal” size, I bet that cup would hold a gallon of coffee! After a long, frustrating slog, I finally finished Big Wheels. 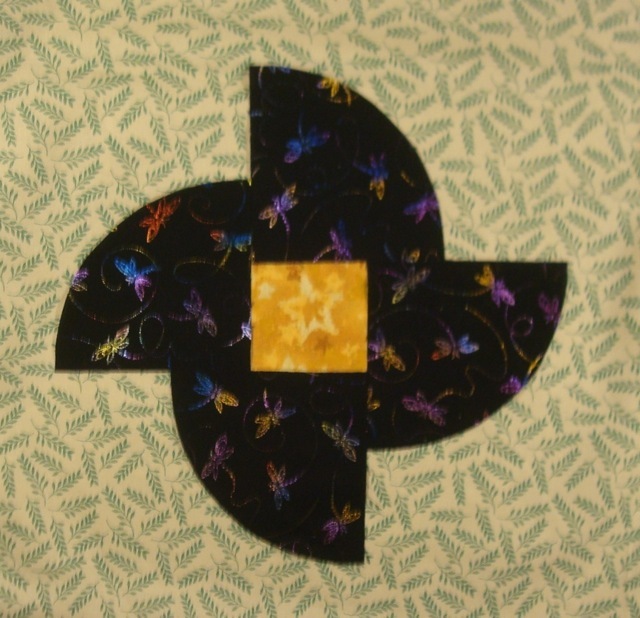 I decided to keep the border plain except for the corners because I had some really great ideas about quilting circles filled with “filler patterns” in them. Originally I was to insert half-circles in pale green and pale yellow. Grandmother’s Choice block 35. I could make one more and stop here. Hmmm. I caught up on Grandmother’s Choice, but I didn’t like this week’s block (Sunbonnet Sue), so I am skipping it. I will either make another block probably from Dear Jane or one of my other “block books. I played with some of the left over squares from the charity quilt I showed last time I posted. This time I am working in half-square triangles and quarter-square triangles. Nothing about it is exciting me about this project, though. I might just abandon it to someone else’s care eventually. I finally finished the row for the final month of my Guild’s Row Robin. The final row of my Guild’s Row Robin. It’s bright for me, and I think I overdid it with the background fabrics. I should have kept within a narrower color range, but whoever gets it can rip it off of her quilt and toss it, if she desires. This Sunflower block is twice the size of the ones for to Row Robin. The nice thing about the strip I did (the theme was “Summer”) is that I decided I really liked the sunflowers if I could “free” them from the too busy background. I made the block in a bigger size and will be putting together an entire quilt of them. I will also be writing instructions on this block (which has NO inset seams!) It’s not that terrible, once you realize that sewing on a 60 degree angle is not much different from sewing on the straight of grain as long are you are careful not to stretch the bias. So, that’s what I’ve been up to. I’ll have to wait to take a picture of the finished Big Wheels until the construction on my patio is done since that’s the only place I can hang any quilt of size and get far enough away to take a picture! I don’t actually make resolutions any more. It wasn’t that I didn’t keep them. It was more that I forgot them because, like Ed, my brain seems to be the size of a walnut sometimes. And since it’s so cold out (it’s in the single digits as I write this and it’s midmorning.) I am really regretting not having gotten some of the bigger tops turned into quilts. However, I also decided I would finish writing up the instructions for the birdhouses, formalize the instructions for Catherine’s Wheel/Daystars, and actually test drive some instructions for other writers (which I can’t show you until they actually a)are complete, and b) are finished. In the non-quilting realm, I am going through all my belongs to divest some (mainly books and clothing), toss others (mainly old bills and paper of some vintage). My aim is to do this bit by bit, so I don’t “feel” it, and get myself so organized that if anything should happen to me, my sister (who has never been to my apartment) could come in and get what needs to be done without too much hair pulling. This might take longer than a year, though. Ed likes Fall, too. 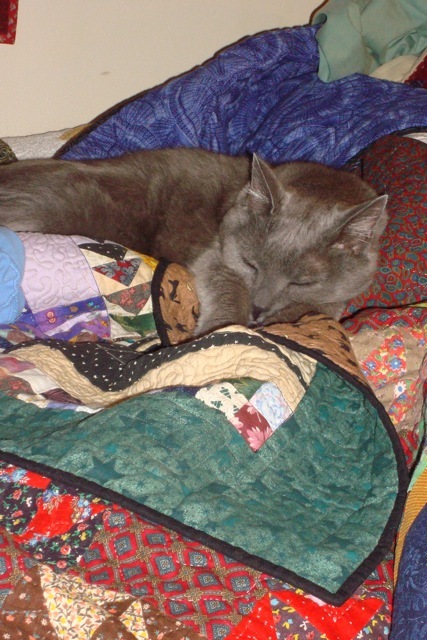 To him, it means more quilts to sleep on! The last Brimfield has passed for the year, the first Quilters’ Guild meeting has not happened yet, and now I get to take stock of what I want to get done before the end of the year. Well, of course, there’s Oldies. I’ve finished the octagon blocks and the square inset blocks, but I still have some 4-patch circles left over. At this point, I’m planning on making it 6 x 4 (54″ x 81″ before I start on the borders.) I had planned on doing it 5×5, but decided I really didn’t want another square quilt, so I have one octagon “left over.” Maybe I’ll use the left over blocks to make a wall hanging. 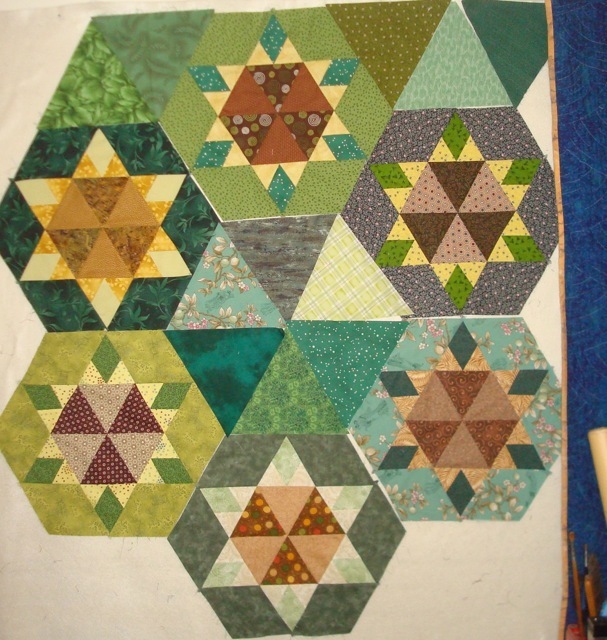 Four Oldies octagons with insets on my design wall. Much as I’m resistant to “making the same quilt twice.” I think I’m even more averse to “wasting” fabric and blocks. Oh well, it’s not like I have to make a decision right away. Before anything else, though, I really must finish quilting Spring Fling. 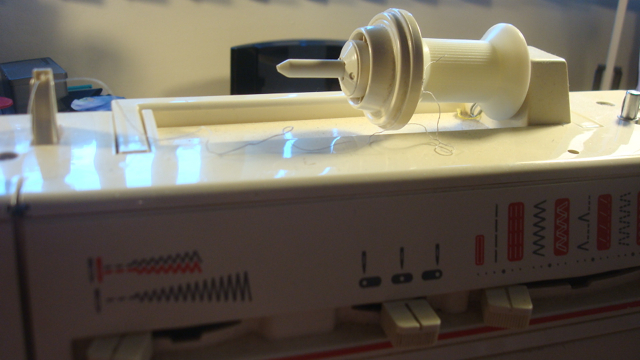 It’s been “under the needle” (so to speak) for the entire Summer. I had wanted to finish it for Show & Tell at my September Guild meeting, and I probably could finish it in two weeks if I don’t shilly-shally, but I’m just not “into” machine quilt at the moment. This is actually something I feel strongly about, especially with the political horror show that is enacting itself daily on television. I thought we fought and won these battles long ago, and now everything is up for grabs again?? Well, I can just hope that the news is making it appear worse than it is. 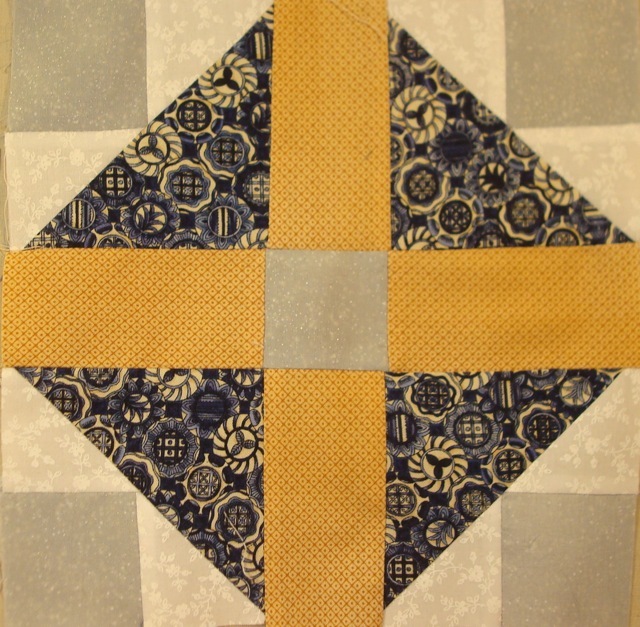 I’ve chosen to do my blocks in blues and golds with white-on-whites as the background. My second block for GC. I know that I’ll probably only be able to keep up with this BotW for about 6 months because that’s how long I managed to stay with the Civil War BotW. 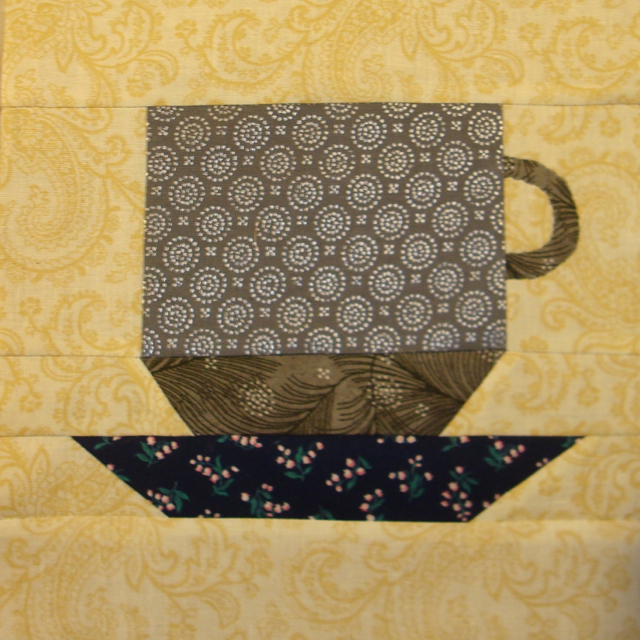 I have put that one together, but I haven’t decided what to do about the borders or the quilting. But, what I really want to sink my teeth into (or, more correctly, my needle) is my “Dear Jane” quilt: My Heart is in the Work. I’ve been thinking about it for some time. It has to be hand-quilted because I hand-pieced it and I think it would be a shame to machine quilt it after all that time. What brings it up, of course, it that I was piecing it during the terrorist attacks on September 11, 2001. I had kept a sort of “diary” (I didn’t have a blog back then) with comments on the design decisions I made about the blocks, fabric, and other stuff.